I-90 is a major thruway which cuts across Western New York. Each year, many drivers en route to vacation destinations, college, or vacation get stopped along this road for speeding. Their speeding tickets are often made returnable to the West Seneca Town Court. If you were given a speeding ticket, cell phone violation, or other moving violation and you are scheduled to appear in the West Seneca Traffic Court, we can help you fight your ticket. Our ticket lawyers have excelled at getting tickets either dismissed or reduced and we have helped thousands of drivers save money, time, and points on their license. West Seneca Town Court is located at 1250 Union Road in West Seneca, New York. The postal zip code is 14224. It is in Erie County. West Seneca Traffic Court is part of the New York State 8th Judicial District. This district also includes the counties of Allegany County, Cattaraugus County, Chautauqua County, Genesee County, Niagara County, Orleans County, and Wyoming County. The court is a court of limited jurisdiction. I can preside over a limit amount of cases depending on the case in controversy. In other words, civil cases heard in this court are usually referred to as small claims cases. 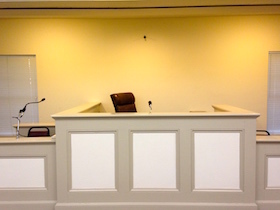 Criminal cases heard in this court are usually misdemeanor cases. The majority of cases heard in this court are traffic tickets. How Many Points Am I Facing? A speeding conviction can result in as little as 3 points against a driver’s license and as many at 11 points. While there are many scenarios that may trigger a license suspension or revocation, one of the most common scenarios involve a driver accumulating more than 11 points within an 18 month period. How Much Is The Cost of a Speeding Ticket? When a driver is convicted of speeding, the judge has the option of imposing a fine as prescribed by law. The fine amount should take into consideration the specific facts and circumstances of the case. On every speeding ticket the court is required to impose a mandatory New York State surcharge. The surcharge is the monies designated for New York State. Fine will increase depending on the nature of the conviction and whether or not the driver is a deemed to be a repeat offender. Join the thousands of drivers that have saved money, time, and points on their license by hiring our law firm. A former New York City prosecutor leads our Ashford Town Court traffic ticket defense practice. We have the unique ability to quickly analyze traffic cases from both the defense perspective and prosecutorial perspective thereby giving you the effective and efficient legal representation. We can be reached at 800-893-9645. Charges We Fight: Here is a list of some common charges were have helped our client’s fight.